Thanks to your hard work, we successfully kept an amnesty from being attached to the National Defense Authorization Act (NDAA) as it was amended in the House Armed Services Committee yesterday. As you know, California Republican Jeff Denham had been furiously lobbying to have his “ENLIST Act,” H.R. 2377, amnesty added to the annual defense spending bill during yesterday’s Armed Services Committee hearing. If adopted, his bill would allow certain illegal aliens to not only join the U.S. military, but would require the Department of Homeland Security to grant them green cards and make them immediately eligible for citizenship upon enlistment. However, Rep. Denham and the amnesty lobby lost to true immigration reform when late last night the top Democrat on the committee offered and withdrew an amendment based on the ENLIST Act because he knew they did not have the support to attach it. Though true immigration reformers won a huge victory, the fight is not yet over. Rep. Denham has vowed to get his legislation passed one way or another! He is expected to offer his amnesty bill as an amendment to the NDAA when it comes to the House floor for a vote later this month. Worse yet, he recently told reporters he wants his legislation to be voted on as a standalone bill — as opposed to an amendment to another bill — in May or early June. With so many opportunities for Rep. Denham to slip his amnesty past the American people, we need your help now! Tell your House Representative to oppose H.R. 2377 — and any similar efforts to grant amnesty to illegal aliens in exchange for joining the military — TODAY! Click here to find the contact information for your Member of Congress. Is amnesty. It not only requires DHS to give illegal aliens a green card upon enlistment, but because of current law, makes them immediately eligible for citizenship. Will do nothing to solve our nation’s illegal immigration problem. To the contrary, it will only make it worse by sending the signal that all one has to do is make it into the country and he/she will eventually be rewarded with legal status. Jeopardizes our national security and public safety by allowing those without valid identification and documentation to enlist in our Armed Services. Is unnecessary. There is no shortage of U.S. citizens and legal permanent residents willing to serve in the military. Each branch of the Armed Services has reached or exceeded 100% of their enlistment targets for fiscal years 2013 and 2014. Moreover, the Pentagon currently plans to shrink the Armed Forces over the next three years to pre-WWII levels. Consequently, passing the ENLIST Act would have the effect of denying Americans who want to serve the opportunity to do so. Want more information about H.R. 2377? 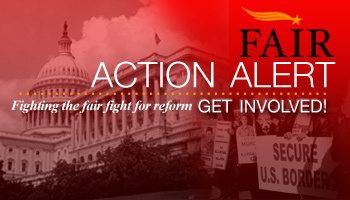 View FAIR’s Top 10 Reasons to Oppose the ENLIST Act. Why do we want people who break the law? There seems to be this goal of attracting the worst of the worst, whether it’s this situation or others. Why do we want those who flout the law, those who come here for a “better life” and collect welfare for their children, those who use false documentation? What sane society holds those people up for special treatment and rewards them with citizenship. Leland it is not “why do we want people who break the law?”……..it is we invited them in, we abused/abuse them now we are stuck with them. Think about it, you also support them……….when you go to a restaurant, movies, etc etc an illegals has been there FOR YEARS washing, picking…etc,……so the question is why do you support them all these years and now all of the sudden….. you complain about it? think…really? Really, John Perot, your argument is weak and doesn’t address the subject, which is the ENLIST Act. Why don’t you tell us why you support it? Of what benefit is the ENLIST Act for the U.S. and its citizens? Please stop blaming those who want our immigration laws enforced for the illegal immigration problem, which is just to avoid telling us why you support illegal immigration and the moronic idea of giving illegals amnesty. I want to know why you believe it is a good idea for criminal foreign nationals to serve in the U.S. military; please tell me? He’s here to just repeat the same stale talking points. f they were. criminals as you say they would not be admitted in the military. You are a LIAR SIR!!! Yet illegal aliens are criminals and some politicians want them serving in our military! You do understand the meaning of illegal don’t you? Whose pointless arguments are like a “broken record” that keeps repeating itself…. Why doesn’t FAIR just edit his pointless commenrts out? Just once I would like to see someone who supports illegal aliens, amnesty, and serving in the military make an intelligent and reasonable argument, which is why I challenge them. I have been debating pro-illegal alien supporters for years and so far not one has succeeded.